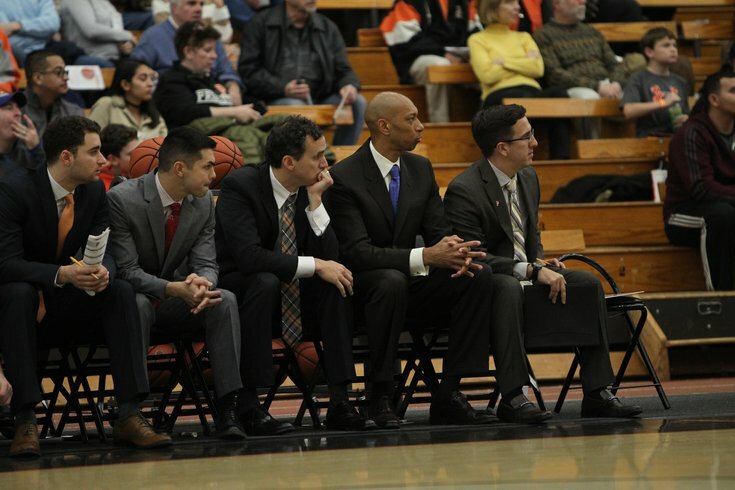 Kerry Kittles, second from right, on the Princeton bench. Kerry Kittles would rather give than receive. He began doing just that as a teenager growing up in New Orleans, working with inner-city youth and then being a life guard two summers for the city’s recreation department. He was also an altar boy. As a junior at Villanova University, a retreat led him to becoming a Eucharistic minister. He is still active in that role, volunteering at a church near his home in North Jersey. After nine seasons in the NBA (8 years Nets, 1 year Clippers), Kittles is back on the court. The lights aren’t as bright in the Ivy League, but as a coach for the first time, the assistant at Princeton is just fine in the shadows. “He was one of the rookie leading scorers when he played for me, and even his second year I thought he was one of those guys,’’ Calipari said. “He could score, he was long, he understood the grind. He was never gonna be late, never gonna be disruptive, never gonna be disrespectful to any player, any coach or any official. Just not who he is." He’d been scratching the itch the past two winters by dropping by to help out at Fairleigh Dickinson. Giving and receiving. Just like coaching. Princeton coach Mitch Henderson, who played at Princeton during Kittles’ college career, said the new guy in the gym is learning, getting better, and taking directions from the head coach. “I think he brings an element to our program that maybe we haven’t had in a long time,’’ said Henderson, in his sixth year in charge of the Tigers. “He played against Michael and Kobe, and played in the NBA finals and played under a lot of pressure. So what he brings our guys is the understanding it’s the same at all levels. Have a clear approach and play the game hard. John Calipari coached Kittles in the NBA during his first three seasons in charge. “I couldn’t be happier for Kerry,’’ Calipari said this week before boarding a plane to Las Vegas. “I just think he’ll be great as a coach, because one, he’s a good person with a good heart, and he cares about people, and that’s the number one thing. As a player in the Big East Conference, Kittles was the kid with the one white sock up to his knee and the other at his ankle. He left Nova as its all-time leading scorer, is 14th in career assists and is 21st in career rebounding. As a junior in 1995, he was voted conference Player of the Year. He did that one better as a senior being named first-team All-America. “He was one of the rookie leading scorers when he played for me, and even his second year I thought he was one of those guys,’’ Calipari said. “He could score, he was long, he understood the grind. He was never gonna be late, never gonna be disruptive, never gonna be disrespectful to any player, any coach or any official. Just not who he is. “Yet, he competed. We played Chicago, he had 17 in the first quarter against Chicago and Michael. So you’re talking about a guy who terrific ability. I really enjoyed coaching him." He loved playing football, also played baseball (“I sucked at hitting"), and in track and field ran sprints and did the high jump at St. Augustine High School. That is the same high school that produced former NBA player Avery Johnson and current LSU running back Leonard Fournette. “People ask me, ‘What’s the next step?’ What does that mean? The next step is now,’’ Kittles said. “It’s the moment. I’m trying to learn everything I can learn now to become a better assistant coach. The better I’ll be at that, over time, whatever happens I’ll know. I’ll know where my path is going and where it will take me." Before the start of the season freshman year, Kittles discovered a gift on campus that few knew. Almost no one. Looking for a hoop after nightly study halls, he found a three-quarter length court in the basement of a girls’ dormitory. Alumni Hall. Knee injuries would eventually make the game difficult, and Kittles decided he didn’t want to life out his life in pain. “People ask me, ‘What’s the next step?’ What does that mean? The next step is now,’’ Kittles said. “It’s the moment. I’m trying to learn everything I can learn now to become a better assistant coach. The better I’ll be at that, over time, whatever happens I’ll know. I’ll know where my path is going and where it will take me. I will figure it out whenever I get there. I don’t like to put any added stress on things I can’t control; like the future. I worry about the now, in what I can accomplish now. Those paths will cross whenever I get there. “I don’t take life too serious,’’ he added. “I laugh at myself all the time. You gotta have perspective. Some people are too anxious to get to the end goal, wherever the destination is, instead of enjoying the ride. Sometimes you can over-complicate things by thinking too much.